A recent search on Amazon.com uncovered 105 books, videos and recordings teaching you how to win at lotto or other types of lotteries. 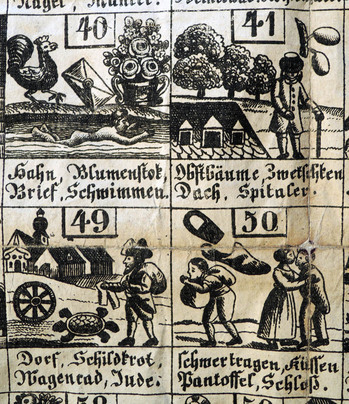 In 1751, when Austria introduced a national lottery, there was a similar outpouring of books teaching the secret of picking numbers. 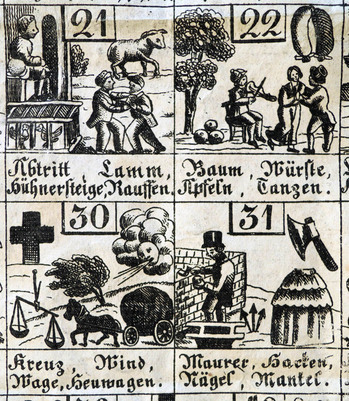 Based on the lotto di Geneva, Austria’s game consisted of 90 numbers and each one became connected with an animal or an object or an action. A person’s dreams might provide the basis of the winning number. 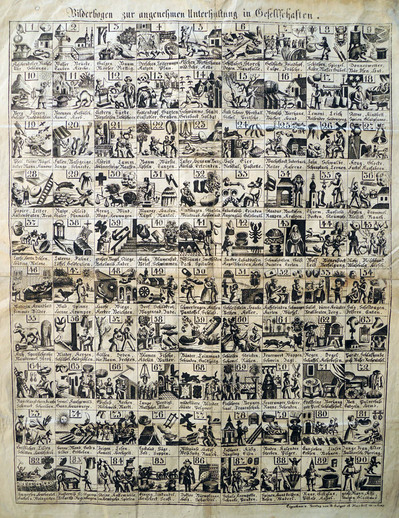 Princeton libraries already hold several dream books used to decode dreams in order to play lotto but recently, we acquired this wall chart for the convenient study and selection of lottery numbers. The chart has 90 squares and each one offers four images or terms connected to that number, thereby charting 360 symbols. The number 40, for example, might relate to a rooster, a flowering plant, a swimmer, or a letter.